I remember being a kid and sneaking into the kitchen to eat sugar out of the sugar bowl. When my gum would loose its flavor, I would dip it into the sugar bowl and then chew it, and 5 minutes later repeat. After a successful night of trick or treating I once offered my mother some of my candy and she said she didn't want any. It was far too sweet. Those words have stayed imprinted on my brain since that night. It was at that point I knew I was adopted. How could I come from someone who didn't like sugar? I was completely and utterly confused. Too sweet? How could anything be too sweet? I mean, sugar is sugar, right? And if I can eat it straight out of the sugar bowl than nothing will ever be too sweet for me. I was horrified at the prospect of not loving sweetness and thought my mother was some sort of alien pod. Nothing in this world could ever be too sweet. There is no such thing. And I kept that mentality for many years. Sugar was the main staple of my diet. When I got into Jr. High I would have an ice cream for lunch every day. That was all. It was delicious! I loved everything sweet. I did have healthy tendencies, so my mother's teachings did not go to waste completely, but if sugar were involved, I just couldn't say no... unless it had been tainted with peanut butter, but that is another story. I began getting headaches sometime. I can't remember exactly when. For as long as I can remember I had debilitating headaches. But I didn't care. I would still go out with my friends. I became very grouchy and moody. My poor family bore the brunt of it. I could never figure out why my head hurt so much. I blamed it on thinking too much. I went on a mission, and the headaches didn't get any better. It made it hard to go out some days. I never used it as an excuse, I still went out, but some nights I would get home, curl up on the floor and just hold my head. I couldn't cry because that would hurt too much. I just lay there and moaned. No amount of pain medication would help it. Sometimes eating would but only sometimes. I still don't take pain medication, because it never works on my headaches. I got home from my mission, Jeffrey and I started to spend more time with each other, and we fell in love. I was going to school and working full time, and I still got the headaches. Any kind of movement would cause excruciating pain. They seemed to be getting more frequent. I went to a doctor and he gave me some migraine medication, but I didn't have the migraine symptoms. No aura, no flashing lights, no sensitivity to light, just pain. Lots and lots of pain. The meds didn't work. The first few months of our marriage were a nightmare. Jeffrey was the most loving and wonderful man in the world. But the pain escelated. I couldn't figure it out. And then I had a talk with my brother. He is a doctor, did you know? He gets all of my medical questions, though now I try to google it before I ask him because he is so busy. He said he thought I am hypoglycemic. I looked it up. Guess what, I had all they symptoms. I talked to a different doctor (not the first one who gave me migraine meds) and he said I probably was. The thing with hypoglycemia is it is very hard to diagnose, and only half of the diagnoses are right. So, I decided to follow the hypoglycemic diet. And then I found out I was pregnant. The pregnancy and the dependence on sugar were killing me. Once I cut out sugar from my diet the headaches went away. Not all at once, but I noticed a huge difference. Also, I cut out white and refined flour from my diet, and amazingly enough, I felt so much better! I have had a beast of a time kicking the sugar habit. Once Keith was born (it was October which means candy corn, and then there is Thanksgiving which means candy corn, and then there is Christmas and you all know what that means, TONS of sweets, and then there is Valentine's Day which means conversation hearts) and I got back on the sugar, and it wasn't so bad. I decided it was probably pregnancy induced hypoglycemia. And here I am pregnant again. I have had very few symptoms, until about a week or two ago. I decided I need to lay off the sugar. It is a hard thing for me. But I decided it was probably necessary. Luckily it hadn't hit me until just now rather than 6 or 7 months earlier. And I have a doctor appointment today. Actually in about an hour. What does that mean? Glucose. *Shudder* Since I most likely do not have diabetes but instead have hypoglycemia (the opposite of diabetes) I don't have to drink that horrid drink. Instead I get to eat a snickers and drink a soda. All under 5 minutes. A snickers and a soda under 5 minutes. And then nothing after that. No water, no crackers, nothing to get rid of that horrible sugar taste in my mouth. The taste I used to love has now become kryptonite to me. And then I have to get poked by a needle. How is that good for me? Now excuse me while I go scarf down (can't even enjoy it!) a snickers and a soda. And wish me luck that I don't go into a sugar induced coma. Hmm... maybe you should have your OB refer you to an endocrinologist to officially get tested. I have hypoglycemia (it's hereditary, my dad has it too). I always have to meet w/ an endocrinologist when I am pregnant for testing, and am always told TO eat white flour and at least a half candy bar a day to keep my blood sugars UP. It's a great excuse to load up on carbs :) But really your doctor shouldn't just go off of you "telling him/her" you are hypoglycemic, they REALLY should refer you to a specialist especially since you are pregnant. Snickers is my weakness. That and chocolate chip cookies. I tell hubby if he wants me to love him forever, bring me a diet coke from the fountain and chocolate chip cookies. Ugh, I had to drink that awful drink a couple weeks ago and I was hoping and praying that my past hypoglycemia wouldn't make me have to do it again. Thankfully I didn't and everything checked out! I blame that on the green smoothie diet and cutting out the same stuff you were talking about! My hypoglycemia story is much the same as yours, except I found out a bit sooner in life and since I changed my dietary habits long before getting pregnant, I don't notice the crazy blood sugar problems I used to have! But, I'm not perfect and still I crave sweets at night. But I try to make the craving go away with fruit instead of junk food. Sometimes that works okay for me. Other times I realize that I should just ignore my craving because I don't feel better afterward. eating a snicker bar and soda sounds much better than that gross drink. 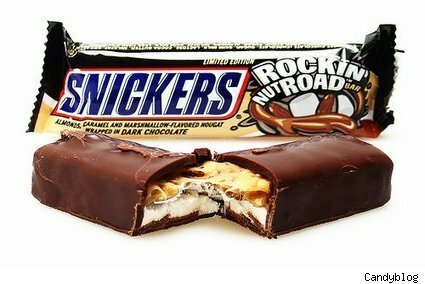 k, i had no idea that snickers had a rocky road bar.....how have i lived my life so long without knowing this?? ?